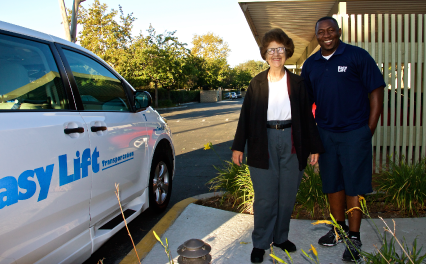 Drivers are responsible for operating several types of transit vehicles in a safe, courteous and reliable manner to transport passengers with physical, emotional, or developmental impairments so they experience safe, reliable and high quality transportation services. Drivers follow a predetermined route and/or daily manifest throughout Easy Lift’s service territory. Easy Lift provides service for approximately 19 hours Monday through Friday and approximately 16 hours of service on the weekends. Generally, Easy Lift provides service on holidays, but hours of service may vary. Driver shifts may vary depending on business need, and at the sole discretion of the Operations Manager. Operates medium duty and small Para transit vehicles in a professional manner that ensures all passengers experience a safe and comfortable ride. Provides door-to-door assistance to all passengers. This includes assisting the boarding and exiting of passengers using wheelchairs, scooters or other mobility aids and securing all wheelchairs and scooters in a manner consistent with Company practice and procedure. Transports all passengers in a safe and courteous manner while complying with all company policies relating to the safe transportation of passengers. Performs daily pre/post vehicle inspection, keeps mileage records, fuel and/or fluid consumption records and submits written incident reports as they occur. Will also maintain records of cash/ticket fares daily. Fuels and cleans vehicles in accordance in accordance with current procedures. Report all physical damage, malfunctions and suspected mechanical problems following all reporting procedures. Prepare accident and incident reports in an accurate and legible manner. Communicates on a regular basis with Dispatch. Communication should occur when instances of route deviations, overload, accidents, passenger incidents, medical/behavioral issues, vehicle mechanical/electrical issues, discrepancies on schedules, (such as ambulatory passengers listed as being a wheelchair rider, incorrect street numbers, etc.) and passenger complaints. Enforces company policies regulating passenger conduct and advises passengers of rules and regulations when necessary. Interacts with senior citizens, disabled passengers, and the general public in a manner that demonstrates compassion and commitment to their specific needs. Maintains a comprehensive knowledge of all Easy Lift operations policies and procedures. Be at least 21 years of age; possess a valid California Driver License with a verifiable driving record acceptable to Easy Lift’s property & casualty insurance carrier. Knowledge of California Department of Motor Vehicles (DMV) regulations governing the safety and operation of public transit vehicles. Satisfactorily complete a driving evaluation, California Department of Justice criminal background check and drug and alcohol screen. Complete a medical examinationcertifying the meeting of medical standards to operate a commercial motor vehicle as defined by 49 CFR 391, Subpart E every two years. Ability to sit in a variety of Para-transit vehicles with a minimum of three inches of clearance between the Driver’s body and the vehicle steering wheel. Satisfactorily complete all required company training. Must possess basic geographic knowledge of South Santa Barbara County. Ability to interact with the general public using courtesy, tact, and good judgment and ability to maintain a calm, diplomatic and tactful attitude in dealing with difficult passengers and situations. Ability to effectively react to emergencies by following established procedures while remaining calm and self-assured. Ability to cooperatively work with others; be respectful of co-workers, promote teamwork and work constructively management, dispatchers, and other drivers. Knowledge of proper two-way radio etiquette, and effectively communicates with management, dispatch, and other drivers. Ability to interpret oral and written communications and accurately and legibly complete reports in English. Knowledge of Easy Lift Operating Policies and Procedures and implement them in a calm and professional manner. Knowledge of basic vehicle maintenance routines, and the ability to detect and report obvious or suspected mechanical problems on the vehicle(s). Capable of operating technology and equipment including wheelchair lifts, tablets and two-way radio systems. Maintain a personal appearance consistent with Easy Lift practice and policy. Available and willing to work varying shift hours consistent with his/her stated availability which may include nights, weekends and holidays.